Keynote speaker, Hester Lipscomb, Ph.D.
HOUSTON – The Southwest Center for Occupational and Environmental Health (SWCOEH) at UTHealth School of Public Health hosted its 18th Annual Pilot Projects Research Symposium on June 3. The keynote speaker was Hester Lipscomb, Ph.D., M.P.H., professor emeritus in community and family medicine at Duke University Medical Center. Lipscomb, a world-renowned occupational epidemiologist, gave a presentation on evaluation methods in occupational safety. This was followed by presentations given by the seven pilot project awardees on their research findings. Attendees included UTHealth faculty, trainees, students, and staff from the School of Public Health’s Houston and San Antonio campuses as well as The University of Texas Health Science Center at Tyler. 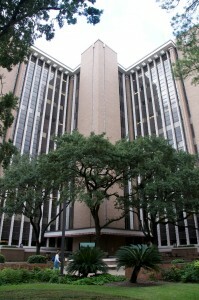 The symposium was held in Houston with ITV to San Antonio and Tyler. Raymond Jones, M.S. presenting for Bovorn Sirikul, Ph.D., Southeastern Louisiana University: “Physiological Strain Incurred During Simulated Fishing Work in a Hot and Humid Environment"
The goal of the Pilot Projects Research Training Program (PPRTP) is to enhance the SWCOEH regional outreach efforts in research training and to foster stronger inter-institutional ties in occupational health research within Public Health Region 6 (PHR 6) (Arkansas, Louisiana, New Mexico, Oklahoma and Texas). The objective of this program is to provide a support mechanism for pilot research projects initiated by junior faculty, graduate research trainees, and new faculty researchers in the field of occupational health and safety. Since 1999, the SWCOEH PPRTP has awarded over $1.2 million to 126 researchers in Region 6. The SWCOEH is funded by a grant by the National Institute for Occupational Safety and Health, Grant Number 5T42OH008421. The director of the SWCOEH is Elaine Symanski, Ph.D., and PPRTP director is David Douphrate, Ph.D., both in the UTHealth School of Public Health Department of Epidemiology, Human Genetics and Environmental Sciences. - Written by Michelle McDaniel, SWCOEH Continuing Education Coordinator in collaboration with David I. Douphrate, Ph.D.